First off, this appliance heats water fast, a benefit that will save you both time and money. It is also highly convenient to use. 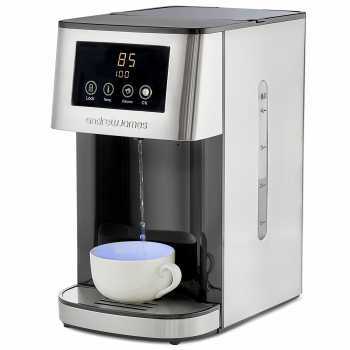 And, if you are one of those passionate coffee or tea lovers who brew beverages at just the precise temperature, a single cup hot water dispenser can do just that. If this sounds like an appliance you could use at home take a look at our one cup kettle buying guide and discover the most important features to look for while shopping and much more. The Andrew James Electric Hot Water Dispenser & Purifier with Filter is one of those kitchen appliances most people would overlook only to realize it is impossible to live without one after getting it. A workhorse piece of equipment, this hot water dispenser is big, functional, and has an industrial look that means business. With this one-cup kettle, you can do everything from brewing a delicious cup of coffee or tea, to quickly boiling water for cooking, or simply enjoying a cup of healthy water. Get the full details of what to expect from it in this guide. How do you like your coffee – weak, strong, warm, or steaming hot? Are you a tea-obsessed junkie who will not drink your beverage of choice unless it is brewed at just the right temperature? Well, whatever your preferences, you can be sure that this one cup water heating machine will not disappoint. This is thanks to its versatile functionality, which is accessed via a smart LED display touchpad with 4 touch buttons. These include a child safety lock button for added security, a temperature-setting button with 5 pre-set options (55, 65, 75, 85, & 100 degrees Celsius), a volume setting button with 3 built-in options (100ml, 200ml, & 300ml), and an ‘ok’ button for starting the kettle. Drawing hot water from the kettle starts with unlocking the machine. From there you go on to select temperature and volume settings by repeatedly pressing the relevant buttons until the LED display shows your desired choice. After that, press the ok button and water will start flowing out as it heats up. Speed is one of the most impressive features of the Andrew James hot water dispenser & purifier with filter. This appliance is arguably the fastest one cup kettle around. And, that is a big a selling point considering all one-cup kettles are naturally fast. With other models, you normally get speeds of anywhere between 25, 40, or 50, seconds. This one, however, gets the job done in a mere 5 seconds! It’s perfect for getting instant cups of coffee and saving on energy consumption. Its large 4 litre water tank loosely translates to well over 16 cups of hot water. 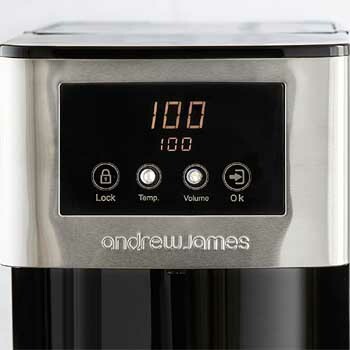 Aside from being faster than your average one-cup kettle, the Andrew James dispenser is also bigger than most. It features a massive 4 L tank, which is the largest capacity we have come across so far. In case you do not grasp just how big the tank is, 4 litres loosely translates to well over 16 cups of hot water. When it comes to dispensing water, you have two options. You can either select one of the 3 preset volumes or go the manually controlled route, which allows for a continuous flow of hot water. For the latter option, you will need to press ‘ok’ to start the dispenser and then once again when you have collected the amount you want. As you may have picked up from this single cup kettle’s name, boiling water is not the only thing it can do. 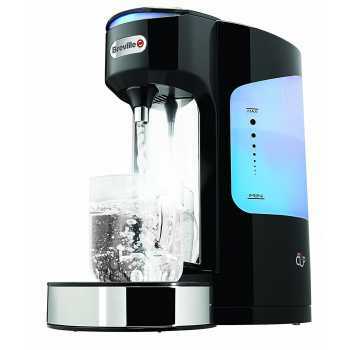 It doubles up as a water purifier and comes with not 1 but 2 long-lasting Aqua Optima Filters for the job. Each filter can purify up to 150L of water in its lifetime. So, it will be quite a while before you have to worry about buying new ones. Aside from filtering the hot water that goes into making your beverages, you can also draw filtered unheated water for drinking. For this, simply leave the temperature setting at zero when you run the kettle. With all its amazing features, you would think that the Andrew James Electric Hot Water Dispenser & Purifier with filter costs an arm and a leg. Quite the contrary, the appliance is reasonably priced and comes at an affordable cost of less than £80 (at the time of writing). Therefore, if you are looking for a high performing one-cup kettle that will be able to serve a family or an office setting, this Andrew James model is a keeper. The features of this one cup kettle work nicely together to offer a very easy to use appliance. Its stylish gloss black kettle with stainless steel trim and a cute illuminated water tank that glows blue when boiling sits on a 360-degree base that will heat up the water regardless of how you place the jug. Therefore, whether you have a left or right dominant hand, you will be able to use the kettle without feeling awkward. 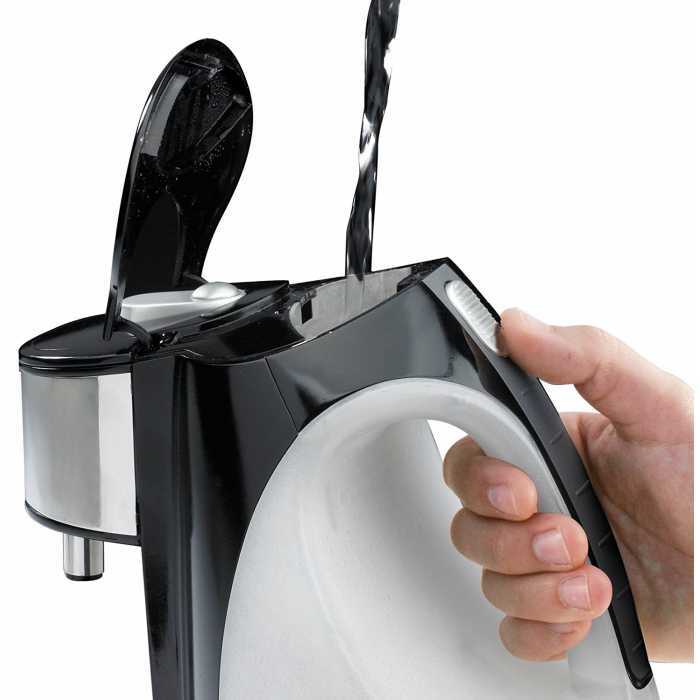 Aside from its attractive look, the kettle is also convenient as it detaches from the base for easy filling at the tap. Filling the tank is as simple as pressing a button conveniently located on the appliance’s handle to open up the lid. The rim of the tank is large, so you do not have to struggle to find the perfect spot under your tap. Boiling water is also easy and fast – press the button on the kettle’s lid and hot water will flow out through the appliance’s spout. Like all one cup kettle dispensers, this Breville VKJ142 is fast. It uses a 3KW (3000 watts of power) heating element which provides a fast boil in less than a minute. And, you do not have to worry about the heating element getting in the way (especially when it is time to clean up), as it safely hidden. At 1.5 litres, the tank of this Breville hot water dispenser might not be the biggest out there but is more than enough to suit any tea or coffee enthusiast. You will be able to get 5 cups of hot boiling water out of the tank before it is time to fill it up again. And not just any cup size, but 250ml (100ml shy of a mug) each round. The Breville HotCup VKJ142 – 1.5 Litre single-cup kettle is as easy to clean as it is to use. The removable drip tray at the base and the stainless steel finish facilitate an easy cleaning process. Also included is a permanent limescale filter which helps reduce mineral buildup within the one cup kettle, further making cleanup a breeze. 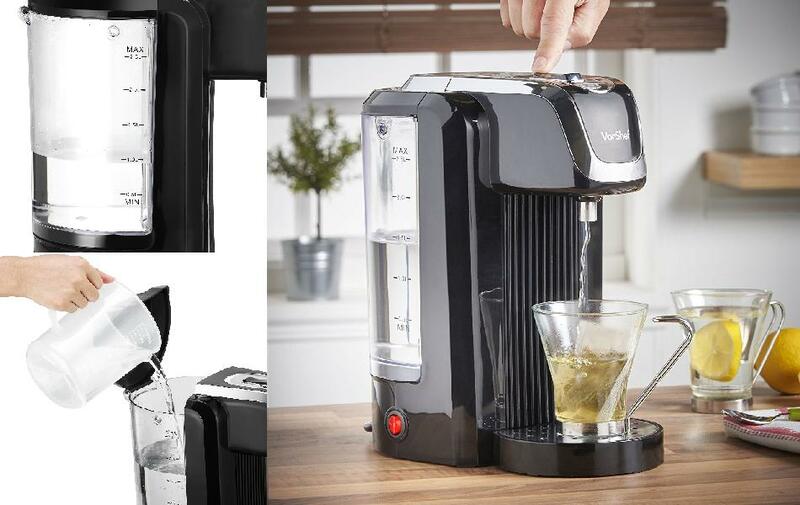 Breville got everything right with this HotCup VKJ142 hot water dispenser. It has a nice sleek look, is quick as well as easy to operate & clean, and highly useful when you need a quick pick-me-up cup of coffee. Overall, this is an all-round brilliant one cup kettle for the price. 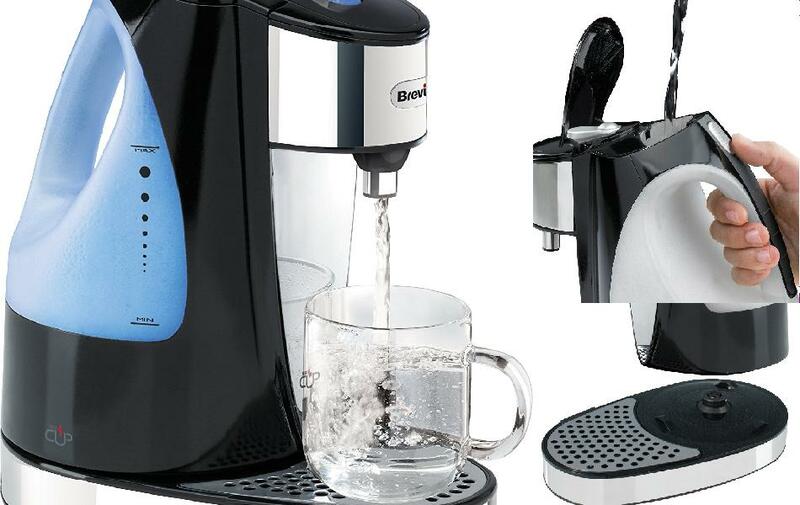 The Breville HotCup VKJ318 – with Variable Dispense is a step up to Breville’s VKJ142 single cup kettle. However, it is similar to the latter model in many respects. It features the same 3000 watts of power, 360-degree angled base, easy-to-fill tank, and the convenient removable drip tray. It even has the same sleek and sophisticated style of gloss black body with hints of stainless steel coupled with a cute and helpful water tank that glows. Yet, it costs about £85 more compared to its counterpart. So, what is so special about the Breville VKJ318 one-cup hot water kettle? Join us in this comprehensive buyers guide as we delve into the inner workings of the Breville HotCup VKJ318 single cup kettle. The Breville HotCup VKJ318 is incredibly easy to set up and use. To fill up the water reservoir with water, simply press the lid release button found on the top back. You can grab the handle and lift off the tank to fill it under a tap or simply pour in water using a jug. Although it does not swivel, this Breville one-cup kettle has a 360 degree angled base. This means the water tank can sit on the base in any position. Therefore, you can place the drip tray to the side or position it behind the appliance such that the tank handle is directly in front of you. As such, this will help to avoid twisting your wrist while reaching behind the kettle to grab the water reservoir. Controls provided for operation are very intuitive and simple to use. Before hitting the start button to begin the heating cycle, you can turn the dispense capacity dial to select the desired cup size. 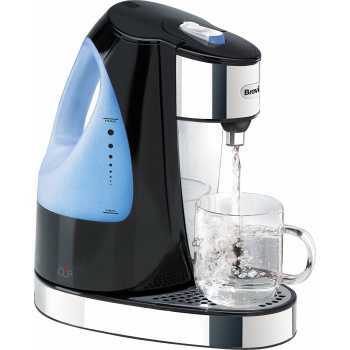 Upon heating the selected cup size of water, the kettle automatically stops and dispenses the heated water. There is a stop button as well that not only turns off the heating element but also cuts off water that is flowing out. Although Breville places the boil time at just 60 seconds, this one-cup kettle is actually much faster. We noted that the kettle heats the largest capacity of 350ml in about 40 seconds. Heating smaller dispense capacities or preparing subsequent cups spans an even shorter duration. This is where the Breville VKJ318 really shines. To begin with, its 2Litre tank capacity is 500ml more than the VKJ142 version. 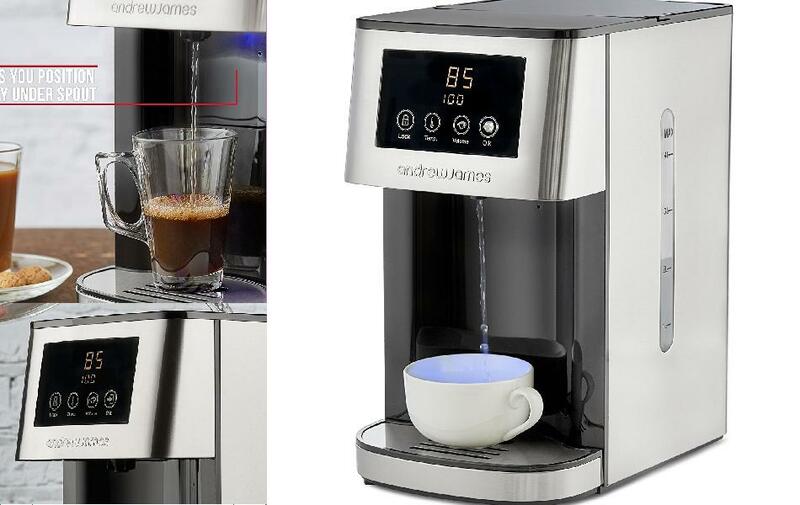 It also has a variable water dispense function that provides you with 9 different cup sizes from which to choose. Simply turn the dispense control dial towards the teacup icon for smaller cup sizes or point it more towards the mug icon to dispense larger amounts per heating cycle. The inclusion of a stop button also means that you can draw as much hot water as you need. For instance, if you inadvertently choose a dispense capacity that happens to be bigger than the cup placed the nozzle, pressing the stop button will prevent excess water from wasting away into the drip tray. Alternatively, if the chosen setting is smaller than your cup, you can press stop and run the kettle again to heat up the appropriate dispense capacity. However, this does not work instantly since the appliance requires a few seconds to cool down in between run times. For easy cleaning, the Breville HotCup VK318 features a removable drip tray. The tray can collect up to 1 litre and features a cover with slits that conceals spills. 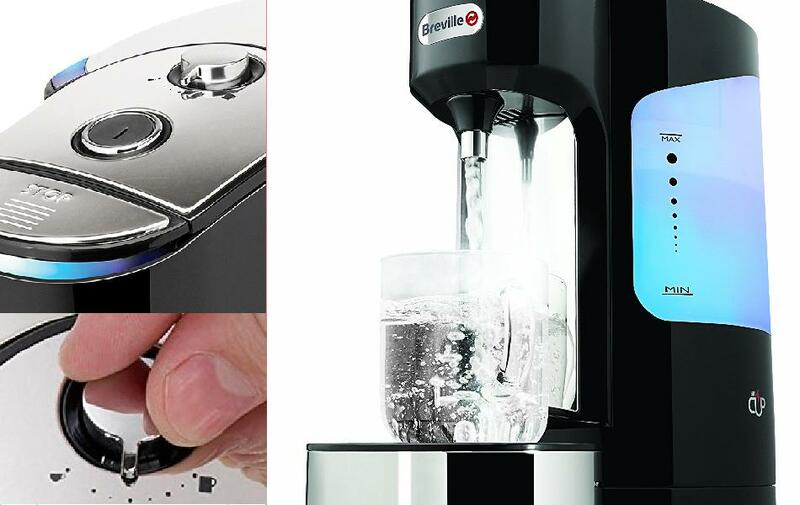 If you are looking for a hot water dispenser that can filter out limescale and chlorine, opt for the 1.8Litre capacity Breville HotCup instead, which comes with a Brita filter. 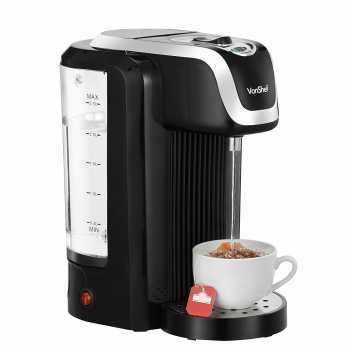 The Breville HotCup VKJ318 is a well-made appliance that oozes elegance. And, its multiple choices for cup size and manual stop button are certainly good features to have in a one cup kettle. The only problem is that its price falls on the high side. Therefore, choosing to buy this kettle is a matter between your wallet and personal preference. Indeed, there are other similar options like the much bigger Andrew James Electric Hot Water Dispenser & Purifier with Filter, or the Morphy Richards 130001 Pebble Hot Water Dispenser, which function just as well and offer more or less the same control, yet come at a fraction of the cost. Featuring a combination of a cool retro design with attractive pebble colour and on-trend matt effect, the Morphy Richards 130001 Pebble Hot Water Boiler will add some flair to your kitchen worktop. However, looking good is not the only thing this one-cup kettle is great at. It is also designed to satisfy your need for instant hot water, whether you want it in small doses or large volumes. 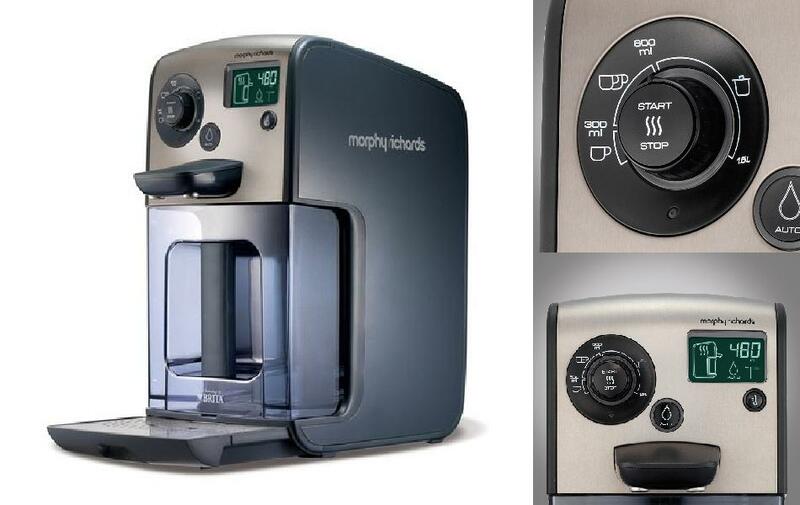 With this buyer’s guide, we take you through the features, speed, and dispensing capabilities of the Morphy Richards 130001 one cup kettle to help you figure out whether this is the hot water appliance that your kitchen needs. The Morphy Richards 130001 one-cup kettle features a unique design where getting access to the water reservoir does not involve pressing a button or flipping a lid. Instead, you simply lift the appliance’s handle to open up the reservoir cap. The cap is a bit small, so a jug offers the best way to fill up the tank. 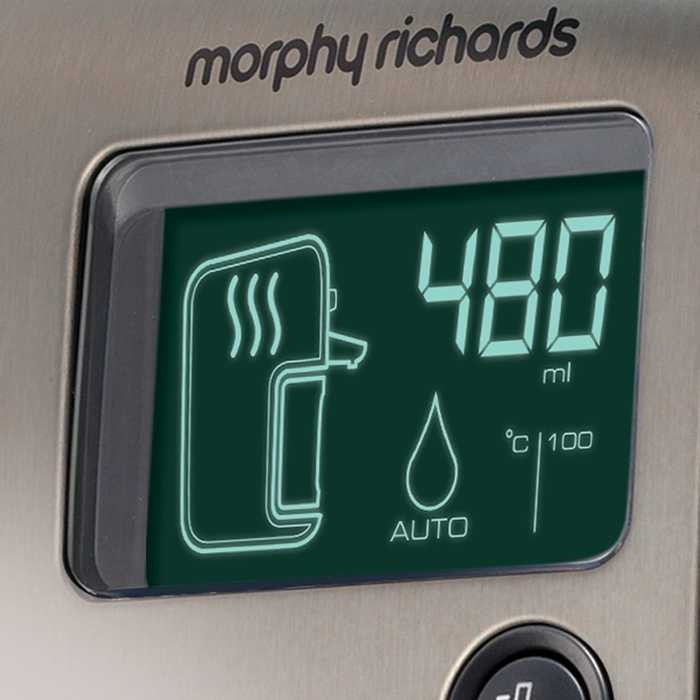 For controls, the Morphy Richards 130001 simply includes a volume-adjusting slide dial, a water-dispensing button, and a cancellation button. All are situated lateral to each other at the top of the machine, making them hard to miss. Funnily enough, the kettle’s buttons are initiated in the order they appear when drawing hot water. First, slide the volume dial to the cup size of your choice (there are 8 options to choose from) and then press the dispensing button to get hot water. As the machine is running, the dispense-area lights up illuminating your cup as it fills up. The stop button comes in handy when you have miscalculated the volume of water selected in ratio to your cup. Simply press it at any point in the boiling cycle to stop more hot water from flowing out. When it comes to speed, the Morphy Richards 130001 one cup kettle is relatively fast. It is equipped with a 3KW heating element, which dispenses hot water in approximately 45 seconds. The beauty of this Morphy Richards single cup kettle is that you can either draw one cup of hot water or empty the entire 1.8L tank in one go. The 8 pre-set volume settings are represented by a string of bubbles that start tiny and grow with each option. A graphic of a small cup sits on the side with tiny bubbles while the icon of a mug sits on the other end. These illustrations are put in place to give you a rough idea of the cup size you are choosing. As for getting the full 1.8 litres of hot water, press the dispensing button and wait for hot water to run out. Repeat this until the tank is empty. The tank on this model is removable and sits on a cordless base with a 360-degree connector. Therefore, when setting up your appliance, you can set the tank on whatever angle that gives you the easiest reach to control the buttons and water dispensing spout. The kettle also features a fully removable drip tray that is easy to clean. One design feature that does not sit well with users is the dark grey finish of the tank. This makes it a little difficult to keep up with how much water is left in the tank. The Morphy Richards 130001 Pebble Hot Water Boiler is aesthetically pleasing, simple, and straight to the point. It will give you a cup or more of hot water and looks great while doing so. For someone who needs a one-cup kettle only for infrequent refills, this Morphy Richards should meet your needs. Is your home filled with tea/coffee junkies? Are you looking for a one cup kettle that offers the versatility to make different brews? Is temperature control important for you in a one cup kettle? Would you like a faster way to boil water for your pastas, rice, and other dishes? Well, whatever your needs, you can be sure that the Morphy Richards Hot Water Dispenser 131004 will more than meet them. Large, fast, convenient, and versatile, this fantastic one cup kettle has a lot to offer. Its impressive smart design adjusts to the needs of the user for hustle-free operation. Find out what to expect from this invaluable kitchen appliance in our detailed buying guide. Filling the water tank of this Morphy Richards 131004 single-cup kettle is probably the easiest part of using it. The tank is designed in such a way you can pull it out from the main unit, fill it up, and then push it back in without making a mess. As for the rest of the functions, there is a bit of a learning curve to go through before mastering how to use the machine. But, this is only because the kettle has multiple controls for its various features. A Start/Stop button gets the dispenser running and cancels the dispensing function mid cycle. A capacity dial presents you with a number of pre-set cup sizes ranging from 150ml to 600ml, while temperature button cycles through the options of 85, 95C, and 100 degrees Celsius when pressed. 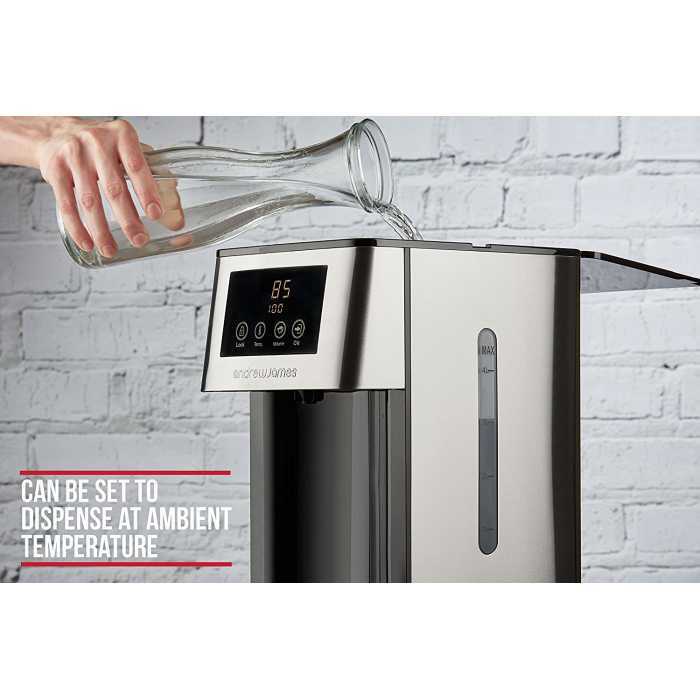 The hot water dispenser also features a dispense/Auto button whose purpose is to reset the system or automatically dispense up to 600ml of hot water. For instance, if you decide to dispense 300ml of hot water the first time you use this kettle, you will need to first press the dispense button to be able to reset the machine. Next, turn the volume dial to 300ml, choose your temperature setting, place your cup under the dispenser’s nozzle, and press the start button. The dispenser will do its job automatically shut down when done. To use these settings the next time you draw water, simply press the dispense button and water will be dispensed automatically. This one-cup kettle uses a 3kW heating element, so it is pretty powerful and quick. A cup will fill up in under 60 seconds, while something bigger like a teapot, or saucepan may take a bit longer. Morphy Richards describe this hot water kettle as featuring a design that works in harmony with your needs. This is no marketing gimmick as that is exactly what the kettle does. 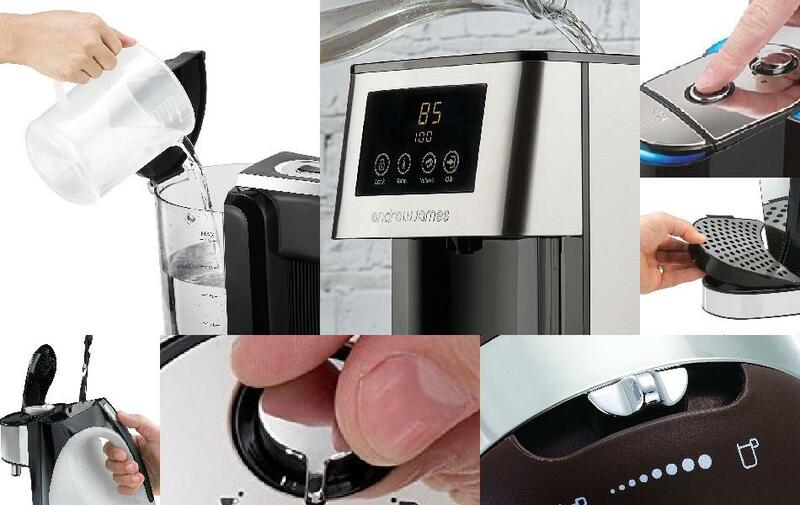 There is a volume dial, which offers several built-in capacity settings ranging from 150ml all the way to 1.5 L. This allows you plenty of freedom to make anything from a cup of coffee to a round of tea for about 6 people, or even fill up a saucepan with hot boiling water for cooking. There is also an option for manual dispensing, which delivers as much water as you want. One unqiue aspect about the Morphy Richards 131004 single-cup kettle is that it has two nozzles. Therefore, you have the option of drawing 2 cups of hot water from the dispenser at the same time. With this unit, you also get a BRIXTA MAXTRA Filter Cartridge for purifying your water. The cartridge goes into the tank where it does the work of getting rid of a number of impurities including limescale, lead, copper, and chlorine. In turn, you end up with not just healthier, but also tastier water for your beverage and cooking endeavors. The filter is fast and takes about 4 minutes to filter 1.5 Litres of water. It also has a relatively long lifespan of 4 weeks. Another cool thing about this Morphy Richards hot water one-cup kettle is that it is full of reminders. As you are using the machine, the LCD screen keeps a constant display of temperature, dispense capacity, and function settings. The same screen also has warning icons that light up when the tank is running low and when the hot water dispenser needs descaling. Even the removable drip dray has an icon that tells you the tray is full and needs to be emptied. In theory, there is no such thing as a one-cup kettle for everyone. 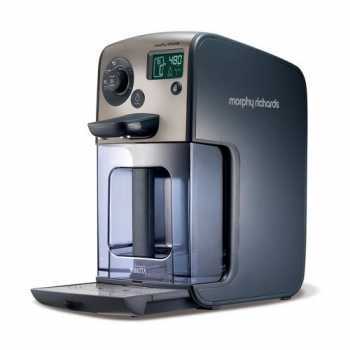 However, the Morphy Richards 131004 Hot Water Dispenser might just defy this notion thanks to its all-round design. 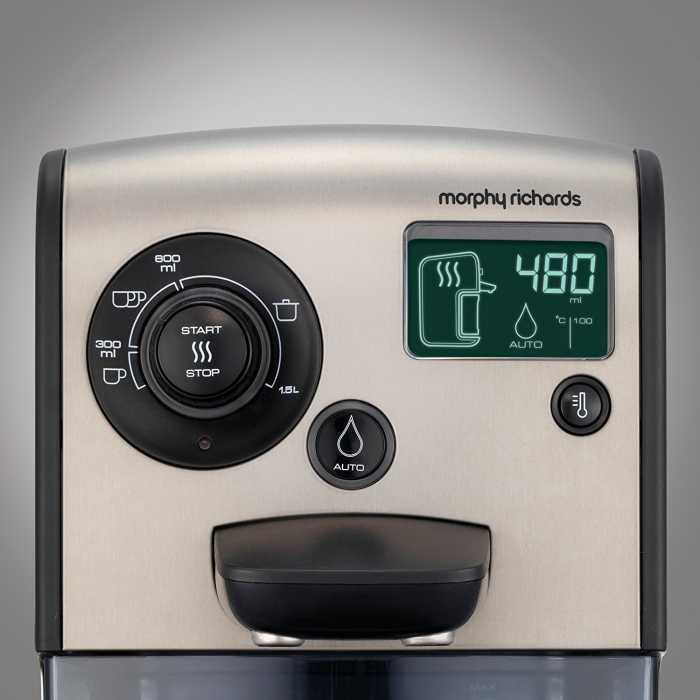 Between the huge 3L tank (capable of holding more than enough water for frequent one cup refills or a full pot), precise temperature control which allows you to make a perfect brew of a wide range of hot drinks, and varied cup sizes with manual mode, there is pretty much no need that the Morphy Richards 131004 kettle cannot meet. Unlike its fellow affordable kettle the Breville HotCup VKJ142 that blends performance with aesthetics, the VonShef Instant Black 13/137 hot water dispenser kettle focuses more on practical benefits. With this VonShef single cup kettle, you get more storage space, faster speeds, and more flexibility, albeit at a slightly higher price tag for what it’s worth. Here is a complete VonShef Instant Black 13/137 buyers guide that will help you know whether this one cup hot water kettle is what you need. 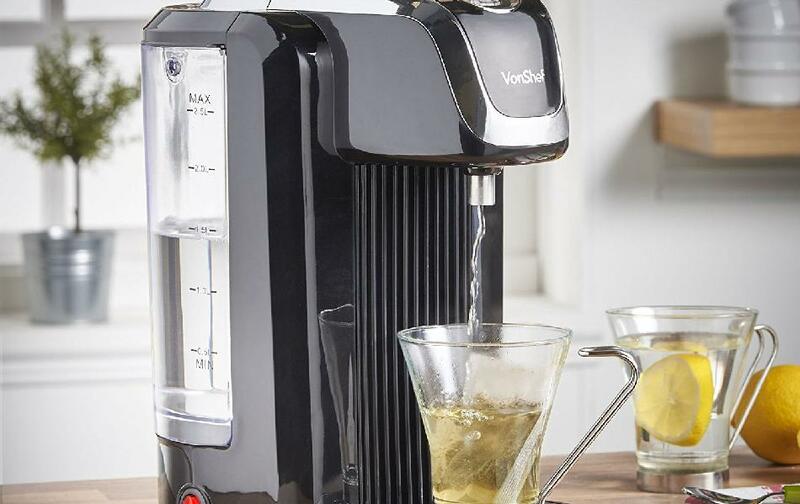 If your reason for investing in a one cup kettle is that you find other electric kettles to be cumbersome, you will love this VonShef Instant Black hot water dispenser. The controls simply include a power button and an ON/OFF switch-like button, both located on the tank’s lid, which flips open. This leaves the process of boiling water to first pressing the power button and then flipping the switch to on. The heating water dispenses automatically in small amounts. Once your cup is full, turn the switch button to off. Simple, safe, and no fuss. VonShef was not kidding when they included the term ‘Instant’ in this one cup kettle’s name. It is powered by a concealed 2.6kW heating element, which admittedly is not the most powerful one available. In spite of that, the kettle is pleasantly fast. It brings water to a whopping 95°C and in just a few seconds. Hot water starts flowing out 5 – 8 seconds in and continues to do so at a rate of 400 to 500 ml per minute. So, if you are simply boiling water for a quick cup of tea/coffee, your mug will be full in 25 to 30 seconds. The VonShef Instant Black 13/137 is one of the larger models in the market. 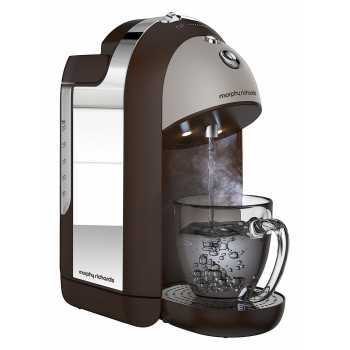 It features a 2.5L tank, which means you can get up to 10- 250ml cups of hot steaming water in-between refills. And, that is not even the best part about this one cup kettle. You have complete control over how much water to dispense with each boiling cycle. Thanks to the on/off switch button, you can use whatever cup or mug size you want. What’s more, you can let water flow into a small flask or teapot to make a round of tea for everyone. Yes, this one cup kettle has a few more goodies up its sleeve. It comes with a removable drip tray for a safe and mess-free time. The included jug lifts right off the kettle for easy filling at the worktop or sink. It is transparent as well and has fill marks that help you monitor water use. You also get a 2-year manufacturer warranty with this one cup kettle, which goes to show that VonShef has confidence in the quality of their product. The VonShef Instant Black 13/137 hot water kettle is in a class of its own. Like all the good one-cup kettles, it is fast and easy to use. However, this appliance does not stop there. It goes on to add a large water reservoir and the smartness to provide hot water with no limit to its list of amazing benefits. Simply put, it is a great pick if you want a one-cup kettle that offers you great flexibility. The only downside is that we believe it is priced slightly too highly when compared to other available models. A one-cup kettle can make a great addition to any kitchen. There is more than one good reason on why you should invest in one. If this sounds like an appliance you could use at home take a few moments to read this one cup kettle buying guide and discover the most important features to look for while shopping. Since the biggest allure of one-cup kettles is being able to get a cupful of hot water without having to wait around for ages, speed is the very first thing you should look for when shopping for one. The good news is that all hot water dispensers are fast and will have your cup filled with hot water in less than a minute. That said, different models heat water at different speeds. Some get the job done as quickly as 25-seconds, while others take a bit longer with 45 seconds being the lengthiest amount of time. The method of dispensing water also varies. Some allow water to slowly flow out as it heats up while others boil a cupful of water and then dispense it all at once. For many, this consideration does not even cross the mind. 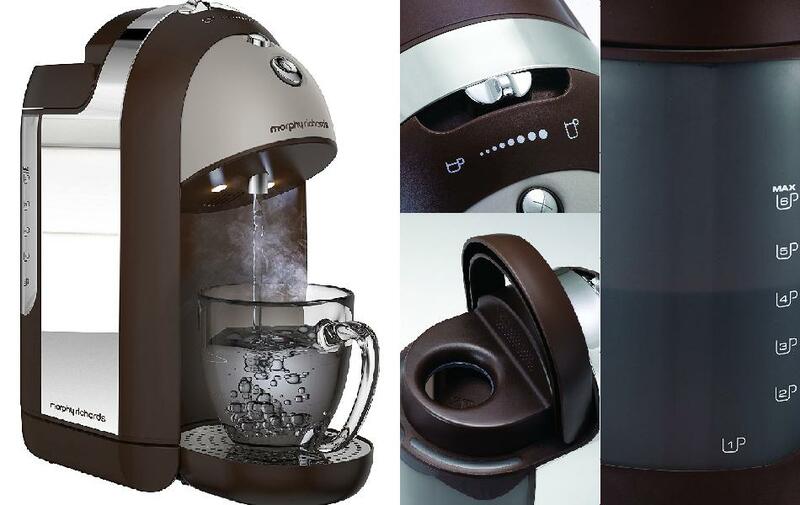 After all, as long as the appliance delivers steaming hot water, you will be able to make your drinks. However, there are certain beverages which getting the ideal temperature is very important when it comes to enjoying the best possible flavour. A shot of espresso, for instance, requires water to be between 190 and 196 degrees Fahrenheit (87 and 91 degrees Celsius) before mixing it with ground coffee. If you enjoy a shot of good espresso, a single-cup kettle dispenser that can heat water to a range of between 90 and 95 degrees Celsius is your best bet of enjoying heavenly coffee. Simply put, choose a kettle whose temperature will keep up with the requirements of your favourite beverages. Some models even feature a variable dispenser, which allows you choose not just how hot you want your water but also how much water you want right down to the mililiter. Unless you do not mind having to constantly re-fill your kettle, you will want one with a sizeable water tank. Options usually range from 150ml all the way to 2.5 litres (an equivalent of ten cups of water). Basically, the bigger the water tank, the better. However, it is your wallet that will determine what size you end up with since one-cup kettles with big tanks can sometimes cost more. It is also wise to look at the design of a tank as you are choosing between different capacities. In some kettles, the tank separates from the machine’s base, allowing you carry it away and fill water under a tap. In other designs, the kettle and water tank are one unit, which means using a jug to fill the appliance will be more practical. Just like in the case of water tanks, one-cup kettles come with the ability to dispense different cup sizes which usually range between 150ml to 350ml. Finding the ideal model is as simple as looking for a kettle whose dispense capacity will be able to fill up your favourite mug. A bit of flexibility is also good to have in your kettle. For instance, you can find a kettle that dispenses only one pre-set amount of water but also features a button for stopping the flow of water at any given moment. On the other hand, a single cup kettle can have several pre-measured dispense capacities that allow you to fill different sized cups or mugs. A drip tray is handy to have in your single cup hot water kettle. It will catch any spills or overflow that may occur while you serve, ensuring you don’t end up with a wet and messy counter each time you use your kettle. For convenience purposes, choose a removable drip tray since it will be easy to empty, clean and wipe. Aside from speed, ease of use is the other big selling point of single-cup kettle dispensers. You simply fill the tank, plug in the machine, place your cup in its rightful place, press a button, and you will have hot water in a matter of seconds. However, there are some features that can make one model easier to use than another. This can be in the form of a dishwasher-safe drip tray, a water filter that reduces limescale build-up, a handle for easy dismounting, a tank that lets you know when water is running low, and so on. It is advisable that you keep an eye out for such features when shopping for your one-cup kettle. If you have decided to invest in a one-cup kettle, you will be happy to know that a higher price tag does not necessarily mean superior quality. To get the best deal, look for top rated models and compare them while keeping in mind the features listed in our one cup kettle buying guide. From making that jolting cup of coffee in the morning, to whipping up some homemade hot chocolate during the dead of winter, to preparing all manner of hot beverages and even foods, hot water is one of those ingredients that you always need in the kitchen. Therefore, it goes without saying that anyone who steps into a kitchen would want to have easy access to hot water. Pouring water into a pot or kettle, applying heat, and giving it a few minutes to boil is obviously one way to go. But, there is a much better alternative in the form of a one-cup kettle. This type of appliance is more convenient, highly precise, and delivers hot water fast – if not faster than an electric kettle! If you love the idea of being able to get small amounts of hot water instantly as needed, read our guide on one-cup kettles: an introduction to everything you need to know. What is a One-Cup Kettle? This super-efficient appliance goes by several names including hot water dispenser, instant hot water kettle, instant water boiler, and single cup kettle. However, the ‘one cup kettle’ title is what best describes this device. As the name implies, it is a kettle-like electric device, which dispenses just one cup (or mug) of hot water. Most one-cup kettles have a water tank. Some models can hold up to ten cups of water but will only dispense small amounts at a time that range anywhere between 150ml and 350ml. This means you will only dispense enough water to fill up a normal sized cup, small or large mug. As long as there is water in the tank, all you only need to do is plug in the device, turn the power on, and the kettle will dispense your 1 cup of hot water. How does it differ from Regular Kettles? The single-cup water dispenser works much like an electric kettle. It has a heating element (a coil of thick metal) at the bottom of the water container. When plugged in, electric current flows into the heating element. The heating element, in turn, takes in that energy and turns it into heat. This heat then transfers onto the water via conduction, causing it to warm up. What then, makes the single-cup kettle different from an electric kettle? Well for one, the single cup kettle is far much simpler to use. Unlike a traditional kettle, this appliance requires no lifting to pour hot water into a cup. It serves hot water at the press of a button. Another problem with boiling one cup of water in an electric kettle is that you have to measure it manually. However, that is not the case with a single cup kettle since the capacity is standardized. This appliance is also more precise than a kettle because it brings water to near boiling point, thus ensuring that little water is lost to evaporation. First off, the water boils very fast. It takes a single cup kettle an average of 25 to 45 seconds (depending on the type) to deliver hot water. Compared to the 2 to 3 minutes it takes a regular electric kettle to bring water to its boiling point, this is much faster. Another benefit is that you will end up using little electricity since the water heats up fast. Since only a small amount of water is heated, there will be no wastage of energy. Aside from its super fast heating capabilities and ability to save up on energy consumption, a one-cup kettle has the affordability factor to add to its list of pros. Single cup water dispensers cost between £35 to £80 at the time of writing. You can also find pricier models, which offer more features and control over how much hot water you can dispense at a time. So, is a one-cup kettle right for you? Well, if you want a quick way to get a cup of your favourite hot beverage, this appliance is arguably the best tool. A one-cup kettle is also worth considering if you find having to lift an electric kettle to pour out hot water to be cumbersome or difficult due to dexterity issues in your wrist or fingers. Once a one-cup kettle finishes heating up water, you simply serve at the push of a button. One cup kettles can make a useful and convenient addition to any kitchen. They can not only help you get your morning cup of coffee faster but also help speed up cooking by having boiling water virtually on demand whenever you need it.